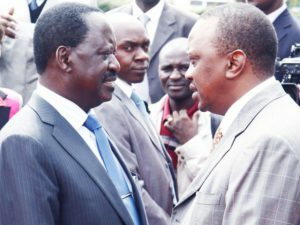 KENYA–Raila Odinga and Uhuru Kenyatta will face off at the ballot on October 17 Kenya’s Interim Electoral and Boundaries Commission (IEBC) has said. The decision was arrived at after the Supreme Court of Kenya nullified the presidential results that were held on August 8. “There shall be no fresh nominations in the envisaged fresh election. The petitioner before the Supreme Court … Raila Odinga and his running mate Kalonzo Musyoka and the third respondent Uhuru Kenyatta and William Ruto shall be the only candidates,” IEBC chair Wafula Chebukati said in a statement on Monday. The IEBC said it is revising the operational and procedural requirements for the fresh polls and will share details in the coming days. In the disputed election, incumbent Kenyatta was declared winner by a margin of 1.4 million votes. This is the third time that Odinga is vying for the top seat. He lost in 2007 and 2013, citing vote rigging on bot occasions. Kenya’s Education Cabinet Secretary Fred Matiang’i had asked the electoral agency to conduct the fresh polls before coming national examinations. Thirdway Alliance presidential candidate Ekuru Aukot has criticised IEBC for the decision to hold the polls with only two candidates. “The decision by IEBC to lock out other presidential candidates out of the fresh polls is invalid, illegal, null and void. We are going to court,” he tweeted on Monday.